NAIROBI, June 1 (Xinhua) -- The Standard Gauge Railway (SGR) commuter service has been a catalyst for growth and transformation in the larger eastern African region since its launch one year ago, said Lu Shan, Chairman of China Road and Bridge Corporation (CRBC). Lu told reporters during the first anniversary celebrations of SGR operationalization held in Nairobi on Thursday that it has created positive impact to livelihoods and businesses along its corridor. "This train connecting Nairobi and Mombasa has provided comfort, safety and convenience to commuters," said Lu. "It is a successful project that has generated growth of the local economy." 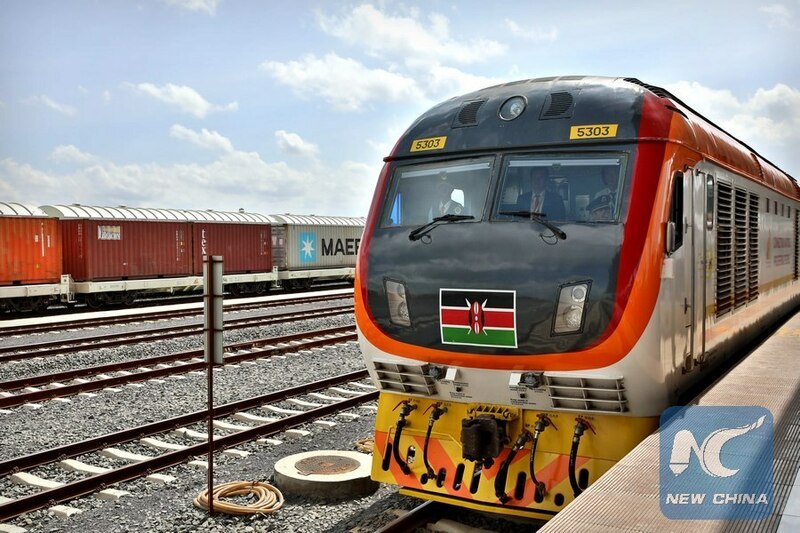 Kenya on Thursday marked the first anniversary since the launch of the passenger train service to operate along the 480-km Nairobi-Mombasa modern railway funded by China. CRBC developed the SGR project, believed to be an early result of the Belt and Road Initiative that will hasten regional growth through cross-border trade, skills transfer and industrialization. Lu noted that the SGR passenger service dubbed "Madaraka Express" has spurred growth of indigenous business while facilitating skills and technology transfer. "Building the capacity of local people has been our ultimate goal. We have set up a joint training program with Kenya Railways Corporation to train local staff in prestigious Chinese universities and familiarize them with operating a new railway system," Lu told reporters. He added that CRBC, which has been operating the SGR commuter and cargo trains, has been able to overcome several challenges linked to cultural differences, water and power shortfall, to provide seamless and quality services. The SGR train has so far ferried more than 1.3 million passengers between Nairobi and Mombasa since its launch by President Uhuru Kenyatta on May 31 last year. Its seamless operations have endeared it to regular travelers, budding entrepreneurs and tourists. Lu reaffirmed the commitment by CRBC to ensure SGR commuter service deliver quality service to a growing army of local and foreign clients. "I feel proud of this project and our desire is to always consider the comfort and convenience of passengers," said Lu, adding that CRBC will improve ferrying of bulk cargo along the SGR corridor. Kenyans marked the first anniversary since the launch of SGR commuter service amid fanfare and optimistic outlook on its ability to elevate the country's status as a regional transport, logistics and manufacturing hub. Lu said the SGR project has enhanced China-Kenya economic cooperation while unleashing mutual benefits. "This is a very significant project that promotes economic cooperation between the two countries," Liu told reporters, adding that CRBC is encouraging local authorities to set up Special Economic Zones (SEZs) along the SGR corridor and generate new jobs.